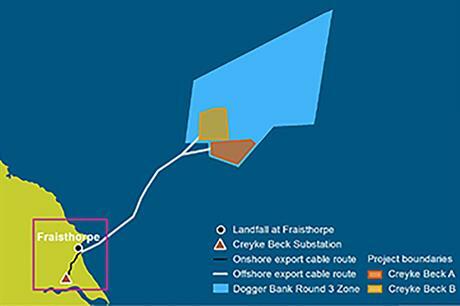 UK: The 7.2GW Dogger Bank zone has been reduced to four 1.2GW projects as developer Forewind focuses on consented projects, dropping the proposed Teesside C & D projects. The decision follows negotiations with the seabed landlord, the Crown Estate, to streamline agreements from development zone areas to project-specific areas. A spokesperson for the Forewind consortium told Windpower Monthly: "The main reason is that Forewind has looked at the consented projects, which is 4.8GW, and it is a huge undertaking. "We want to focus our efforts on taking those four projects from consent through to construction and operation." Forewind comprises developers SSE, RWE Innogy, Statkraft and Statoil. The Dogger Bank zone was expected to include six 1.2GW projects. Creyke Beck A & B, which achieved consent in February 2015, and Teesside A & B which was approved by the government earlier this week. Forewind said it had spent £60 million to carry out studies of the consented projects – the most ever undertaken for an offshore wind project. The spokesperson said the consortium needed to show "continuous development" of the projects, so delaying the Teesside C & D projects was not possible. Forewind has agreed the project-specific areas with the Crown Estate and handed the unused area, including the proposed Teesside C & D sites, back to the seabed manager. In February 2014, investment issues forced the Forewind consortium to reduce the Dogger Bank zone from a planned 9GW to the agreed 7.2GW.